Eddie MacDonald’s expectations for a top ten finish at Watkins Glen International were dashed when he cut down a tire but still managed a thirteenth place finish. Eddie had a solid run going as he moved up from his 12th place starting spot on the grid driving the HRM Motorsports Ford to the seventh position before the mishap. 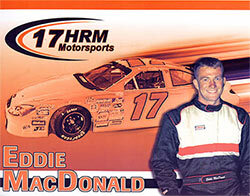 MacDonald said, “ The car was a good top ten car but I just drove it in too deep around lap 45 on the “ Inner Loop” and ended up cutting down a tire but the crew did a great job of getting it changed so I didn’t lose a lap.” He restarted the race in the 23rd position and was again able to move back through the pack into 13th but just couldn’t get to the front. MacDonald said, “ Because of the bad luck we haven’t had a lot of time to focus on the race set ups; we have spent most of our time at the shop fixing the car instead of working on making it faster.” Last year at this time, the team was 11th in points, the same spot they are currently in at this time. With only four races remaining the team is determined to change their luck and hope to do so at one of their favorite tracks on the schedule.